Location: Starting just south of 12th Street and running down to 20th Street. Industrial beginnings: 100 years ago, Main Street was a bustling industrial corridor lined with home-grown manufacturers, distilleries, banks, hotels, furniture stores and restaurants. Mid-century changes: From the 50s through the 80s, the Southside was reshaped by the same forces that transformed many southern cities - globalization, changing business models, new technologies, suburban growth, new freeways and urban renewal. Rebirth from 1997 to the present: Grants and old buildings attract a first wave of businesses, galleries and residences. 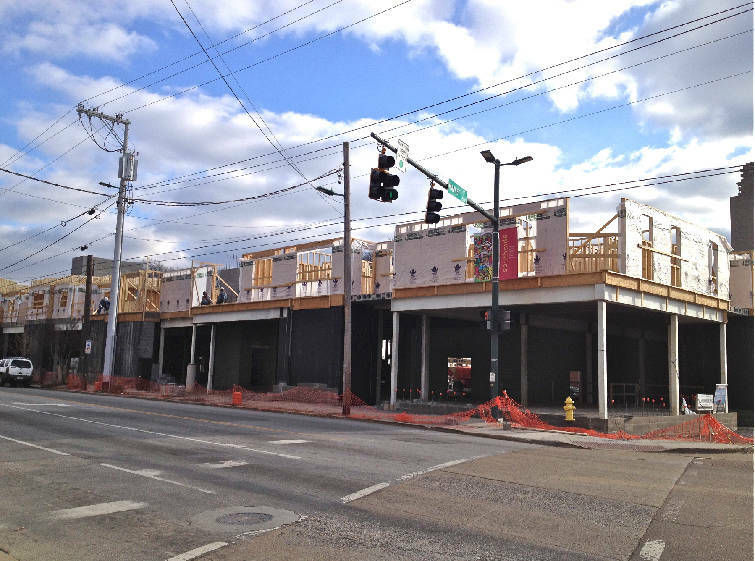 Now with an $8 million Choo Choo renovation, 40 new homes in Jefferson Heights, and long lines at restaurants like Clydes on Main, the Southside is reclaiming its place in the heart of Chattanooga. With a renovated Choo Choo and a wave of new development, the Southside is taking off as Chattanooga's cool place for business. What's the secret? When Trent Brockie checked into the Crash Pad two summers ago, he didn't think his stay at the hostel in the heart of Chattanooga's Southside would last more than a few days. But the 20-something from Orlando stuck around past the cycling event he came to see. Summer turned to fall, and Brockie became known as the hostel's "longest-staying guest." "That was my introduction to Chattanooga," Brockie said. "Just walking around Main Street made me fall in love with this really rugged, yet innovative part of town." One walk led Brockie to a vacant storefront on East Main Street. Drawn to the building's aged brick and timbers, he envisioned the space bringing something "fresh and healthy" to the community. Brockie leased the property and built-out the interior himself. This past August, he opened the Local Juicery, specializing in cold-pressed, raw and organic juices. The Southside's eclectic mix of old and new, business and residential, do-it-yourself and corporate is a major draw for young entrepreneurs like Brockie. "I think the attraction to the Southside is all of the young, up-and-coming businesses in the area," he said. "That's what attracted me. The personality is a little rough around the edges but it's the coolest place in town." The Southside had a similar pull on foodies, Eric Taslimi and Rob Peterson. Taslimi had grown to love the area while working at nearby Table 2 restaurant, and Peterson lives above DeBarge Winery on Rossville Avenue. "We've been watching Main Street kind of do its thing, grow and develop." Taslimi said. "The way that it's doing it just really appealed to us, very locally minded. We just liked where it was going. We like the vibe that it has." So when Taslimi and Peterson couldn't nail down a long-term lease for their classic burger joint in St. Elmo, they turned to the Southside. In March, Slick's Burgers will move to a new building on East Main next to Estate of Confusion. In keeping with the restaurant's hand-ground meats, homemade sauces and craft beers, there's nothing cookie-cutter about the new location. The kitchen will be a vintage 1956 aluminum trailer, half enclosed by a seated dining area. Sliding doors will create a patio on warmer days. The approach is very Main Street, not mainstream, Taslimi says. "I just really believe that people down here are passionate about what they're doing," he said. "It's not just a way to make money down here. You don't see a lot of corporate and franchises. You're seeing small business owners that love what they do. They are putting out phenomenal products, and they're really about a sense of community." More mundane concerns had Michael Alfano eyeing the Southside as a new location for the Comedy Catch. His Brainerd Road location faced expensive sprinkler upgrades. So early last year Alfano toured the Chattanooga Choo Choo complex with operating managers John Kinsey and his son, Adam. Alfano liked the layout. Plenty of space and sprinklers. What he liked even more was the vision of what the site could be an entertainment complex with several different styles of restaurants and venues. What sealed the deal was a walk outside the property. 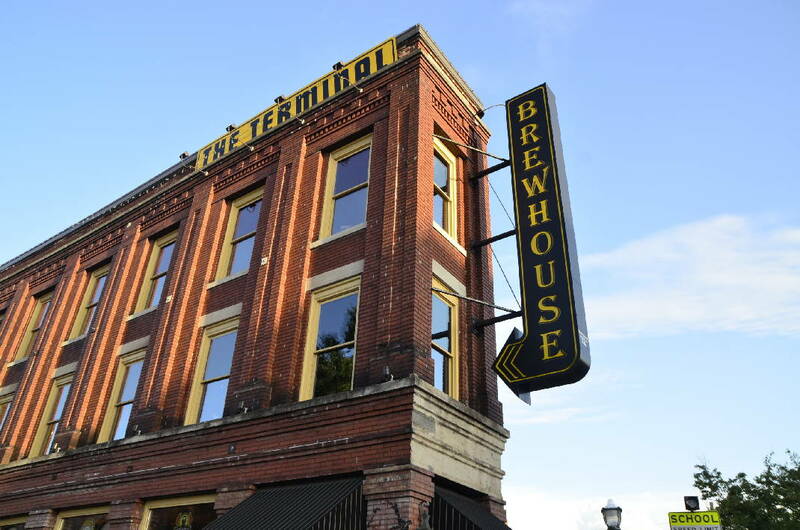 "We stood at the corner of 14th Street, across from Terminal Brewhouse, looking down at where the Crash Pad and Flying Squirrel are," Alfano recalls. They saw the Choo Choo's service entrances, mainly space for air conditioners and dumpsters. The Kinseys pointed out that the covered platform was once a busy loading area, a gateway to the old Terminal Station. Alfano was intrigued at how the Choo Choo could open up again to the Southside. "Can you imagine if 14th Street was a paved brick road, and this whole train platform was a patio?" he asked. That vision will come to life this spring when the Choo Choo completes an $8 million renovation and restoration project. The complex will include the Comedy Catch, a 500-capacity music and entertainment venue, retail space and two new restaurants with outdoor patio seating off of Market and 14th streets. "I just think that's going to be one heck of a circle," Alfano said. "Main and 14th that's where people can park once and just enjoy the entire Southside, have a cocktail, have dinner, see a band, or just walk around." The move represents a heck of a circle for the Comedy Catch itself. It will bring the venue back downtown 30 years after it first opened in the old Dr. Sage's Restaurant. Railroads helped make the Southside an industrial center 100 years ago. Jon Kinsey said the renovated Choo Choo will create a new kind of hub for Chattanooga. "It's going to transform not only the Southside, but also the city to have such a concentration of entertainment and dining facilities in one area," Kinsey said. "Even though the Southside's got a tremendous amount of activity, it will multiply that many times with a new music venue and the Comedy Catch bringing a quarter of million people a year to the area." Kinsey says the Southside's attraction to fun-seekers, entrepreneurs, homebuyers, and shoppers doesn't boil down to any one thing. It's a combination of good things in close proximity. "The Southside has so many different uses," he said. "It's not just an office area. It's not just residential. It's not just restaurants. It's got everything. And a lot people who live here drive very little." Real estate is about location, and Kinsey said the current redevelopment activity reflects the Southside's place in the heart of Chattanooga. It's reminding people how Main Street got its name. "Main and Market was at one time the key intersection of the city," Kinsey said. "It's taking its place again." Furniture maker Rud Montgomery, one of 40 local artists represented at Area 61 gallery on East Main Street, has watched a succession of "For Sale" and "Sold" signs on vacant buildings along Main Street over the past five years. All too often "For Sale" would reappear. "It went back and forth," Montgomery said. "But slowly things are hopping." Many creative entrepreneurs like Montgomery and Area 61 co-owner, Keeli Crewe, moved to the Southside's vacated manufacturing spaces six years ago with support from CreateHere grants and other incentives. Then the recession hit and redevelopment stalled. But that's changing. "I'm thrilled to see it coming back," Crewe said, citing recent completion of community anchors like the Grocery Bar and the apartment/commercial complex rising at the corner of Main and Market streets. Crewe said opening up the Choo Choo to the Southside will be good for business. "Eighty percent of my sales are from out of town," she said. "People walk over here from the Choo Choo and say 'this is amazing. I didn't know this was here.' It's only getting better. That's why I'm not throwing in the towel." 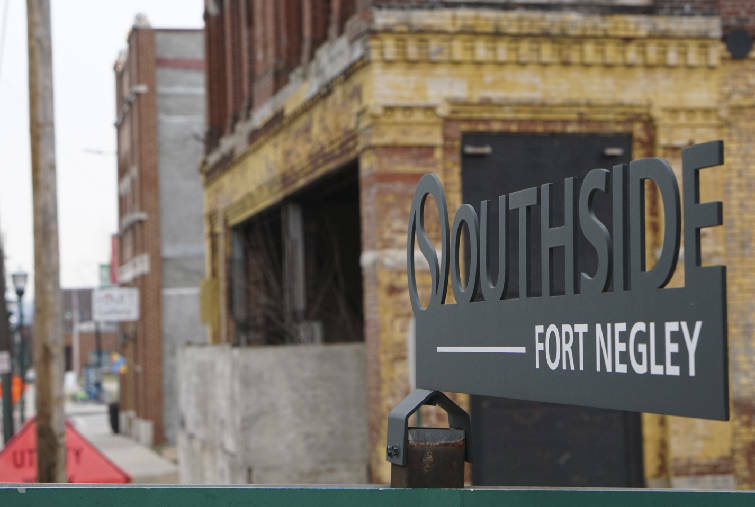 John DeMoss, principal of one of the first financial service firms to move to Southside, sees good reason to stick around as well. The financial services firm moved into the historic Harrington Building on Main Street in 2010 for the additional space and the opportunity to be involved with the growing area. DeMoss also saw a time of slowed development, but has recently been encouraged by greater apartment and retail occupancy as well as the completion of the Center for Integrative Medicine on East Main. His firm has skin in the game. He's put together a group of investors developing 40 new homes in Jefferson Heights, just off Main Street in the location of the old Tennessee Plywood Company. "We're big believers in the area and look forward to seeing the continued development," DeMoss said. "It's been fun to be here at the beginning and watch it all happen." Kinsey notes that the Southside actually weathered the slow economy better than other parts of Chattanooga. He cited the new CraftsWorks Restaurants and Breweries headquarters on West Main, the 30,000-square-foot Southern Surgical Arts building on Cowart Street, and the Center MedSpa on East Main. "I can't think of another office building that's been done downtown in the last three years," Kinsey said. "And there have been three here. I'd say that's pretty significant." Cool old and new buildings. The mix of commercial and residential. Pedestrian friendliness. Ken Hays, a developer with Kinsey-Probasco-Hays, says all this is part of the Southside attraction. But the former River City president is quick to point out that the current activity didn't happen by accident. "If you go back to 96 and 97, there was a major community planning effort to come up with a Southside plan to be a true live-work-play community," Hays said. "A lot of what's going on now is a result of that strong urban planning. Finley Stadium, the fire hall and the downtown school (Battle Academy) were all developed as anchors to create a viable area." Hays, who has lived on the Southside for more than seven years and works in the Craftworks building, called the rebirth a "Chattanooga-way thing." It's the result of the private sector, local government, foundations and communities working together with a common vision. And that work is far from complete. "Downtowns are never done," Hays said. "But clearly I don't think anybody would argue that the Southside has been an amazing success. It keeps getting better and better." This story appears in the February issue of Edge magazine.